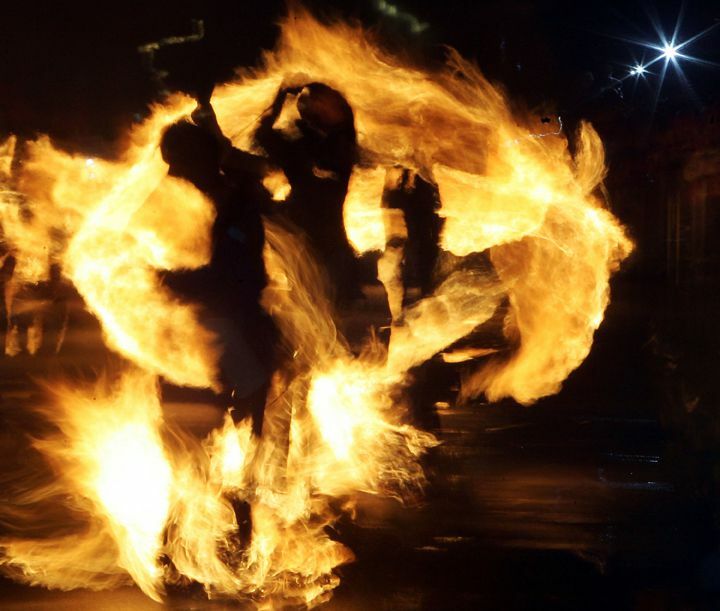 The Stonehaven Fireballs is one of the most dramatic of Scotland's many New Year's and Hogmanay fire festivals. At least 12,000 spectators line the route of the event, and the partying goes on well into January 1st. At the stroke of midnight on December 31st, in the North Sea coastal town of Stonehaven, at least 45 strong Scots, most in kilts, light up the high street by whirling balls of flame and sending showers of sparks into the watching crowd. Festivities get underway with street entertainment at about 11 p.m. with a band of pipers, followed by some very wild drumming. Just before midnight, a lone piper leads the fireball swingers into the town center to the familiar strains of Scotland the Brave. The watching crowd counts down the last few seconds before the new year and, then to the accompaniment of wild cheering, the Stonehaven Fireball Swingers raise their flaming balls, attached to long wire handles, and begin to swing them over and around their heads. Swinging their fireballs all the while, the marchers, led by the piper, make their way through the center of town from the Market Cross to the harbor and, when they tire of swinging them, the marchers throw them into the sea. When the last fireball arcs across the sky and into the sea, the spectacle ends with a huge fireworks display. Stonehaven was once a small fishing village on the coast, about 15 miles from Aberdeen. The festival probably arose from a local 19th-century ritual practiced by the fishermen of the original village of Old Stonehaven. While records are spotty, it's likely that the use of purifying flame to ward off evil spirits and endow the fishing fleet with luck has pre-Christian origins. At one time, only those born in the burgh of Stonehaven could participate. In the 1960s when the festival began to decline, the rules changed, and today, anyone who has lived in Stonehaven for a period of time and who has served as a Fireball marshal for at least one festival can apply to take part. Unlike the Allendale Tar Barl in England, which is a male-only affair, quite a few women march with the Stonehaven Fireball Swingers—some year's women are the only ones wearing trousers. Today, the Fireball swingers make their own fireballs by filling wire baskets with a mixture of flammable materials. Participants keep their recipes secret, but the object is to create a fireball that will stay lit and burn brightly for a long time. Stonehaven has a live webcam positioned at the harbor where the festival ends as all the fire baskets are thrown into the sea. Online watchers can catch the end of the procession by clicking on the Stonehaven Harbor Webcam on New Year's Eve. The procession usually reaches the harbor about 15 to 20 minutes after midnight. The Stonehaven Fireballs takes place at midnight on New Year's Eve in Stonehaven, Scotland. Admission is free. Stonehaven is about 15 miles South of Aberdeen along the A90, coast road. There are train services to get there but none on New Year's Day to return, so your best bet is to take the local bus service. Stagecoach Bluebird runs buses between Aberdeen and Stonehaven. If you don't want to drive or wait for the start of bus services the next morning (after 4 a.m.), you could book a room in Stonehaven. For a relatively small town, it has quite a few places to stay, but book early because they are all likely to be full on New Year's Eve—and prices are four or five times the regular price. Scotland: What's Not to Like? Wait. You Can Ski in Scotland?